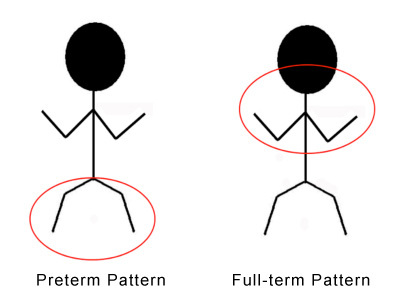 It is important to distinguish between Preterm and Full-term pattern cerebral palsy. The circles on the stick figures indicate the areas of highest tone in the two conditions. The brain damage that results in cerebral palsy in babies born < 32-34 weeks gestation nearly always produces a pattern of cerebral palsy that is worse in the legs than it is in the arms. The common full-term patterns of brain damage produces spastic cerebral palsy that affects the trunk, arms and speech more than the legs. I will write more about the variety of Full-term patterns next week. For now, I want to focus on Preterm pattern diplegia, hemiplegia and quadriplegia as these are the patterns where a Rhizotomy may be of great help. One of the best ways of figuring out which pattern a child has is to look at what happens with new skill learning or moving at speed. The classic pattern for an ex-prem with diplegia would be quite normal hand use when seated in a supported position. However, when the child gets up and starts walking, the hands tighten up. The tone in the lower limbs is more constant in different positions than the variable “activity dependent” tone in the arms. SDR surgery is most commonly done in children born early. The SDR surgery decreases tone in the legs and for those born early, this is the seat of the problem. The data from Dr. T.S. Park’s unit in St. Louis makes this point. The preterm advantage is that the damage is predominantly to the periventricular white matter and it occurs during the period of time when there is active brain growth. The last trimester of pregnancy is described as a period of exuberant neuroplasticity. What that means is that the baby brain actually produces many more cells and many more connections than are needed. For this reason, it is in an uniquely advantageous position to compensate for damage. Children with preterm pattern cerebral palsy have less involvement in speech and language, less involvement in the arm and hand, even in the preterm with hemiplegia, and all groups, including quadriplegia, have a lower incidence of seizures. The majority of children that I have followed through to adult life with preterm pattern diplegia or hemiplegia have gotten through all the average years of education and the majority have at least a college degree, if not postgraduate degrees as well. Intelligence is seated in your gray matter and preterm babies have a predominantly white matter lesion. Over the last 10 to 15 years there has been a definite change in the evolution of spastic diplegia in preterm infants. If they are well managed, with all of the techniques that I have already spoken about in the spasticity series, the ones with mild problems do extraordinarily well. A Rhizotomy is usually not indicated for these children. That is not to say that they will not have continuing problems through childhood growth spurts and puberty, but they usually can be managed reasonably well with Botox only needed during active growth spurts. However, if you are using Botox several times a year, then I suggest a consultation with an active spasticity management clinic. The reality of cerebral palsy spasticity is that it continues to increase in severity with growth. Spasticity usually does not progress once they have finished growing. The other population of children that qualify for a SDR are mild to moderately involved teenagers who are able to walk, with or without aids and have no, or correctable, biomechanical distortions. Many of these young adults may need both orthopedic and spasticity reduction surgeries. In the older child, the spasticity level is fixed and the teen is able to cooperate with intensive strengthening and retraining of a new way of walking after surgeries. I encourage everyone, parents, teenagers and therapists to start a conversation about life with less tone. The 5-year-old child has at least 12+ more years of growing and an average life expectancy of 80 to 85+ years. Find out the facts from the experts, as they apply to the individual child. Is this child a candidate? What would be the best age and stage to consider a surgical intervention? What will it accomplish? What is required afterwards in rehabilitation? How many surgeries have you done? What are the problems and/or side effects? My last word is don’t think any one treatment or intervention will be a stand alone answer. The children are still going to need AFO’s until they stop growing. They are still going to have to be strengthened and retrained into a more normal way of walking. I think it is important for parents, in particular, to talk to the spasticity management team. It is hard to make a good decision without knowledge and the surgeons know more about their surgeries. Parents can then weigh the surgical advice with the medical results and make an informed choice that works for their family. Thank you for this blog, and in particular this entry. My daughters were born at 30 weeks and one suffered brain bleeds. We are very early on this journey, as they are only three months adjusted, but I’m learning so much here. There is so very little out there about neuroplasticity that is not completely anecdotal. I’ll be printing off this entry to discuss with our paediatrician. Dr Pape – I wonder if you would be able/willing to comment on the SPML/PERCS procedure, which is offered by only a few orthopaedic surgeons (Dr Yngve, at UTMB for instance) but which anecdotally and from small research studies seems very promising for spasticity reduction? The one published study I have seen is: Clin Podiatr Med Surg. 2010 Apr;27(2):335-43. Selective percutaneous myofascial lengthening of the lower extremities in children with spastic cerebral palsy. Mitsiokapa EA, Mavrogenis AF, Skouteli H, Vrettos SG, Tzanos G, Kanellopoulos AD, Korres DS, Papagelopoulos PJ. Dear Laura – Thank you for your comment. I will be talking about SPML/PERCS in a few weeks when I will be discussing orthopedic surgeries for spasticity management.I was first introduced to it by Dr Roy Nuzzo in Summit, NJ. http://www.pediatric-orthopedics.com/The_Practice/the_practice.html I have seen some very good results and like you , I wonder why more orthopedic surgeons do not offer it. Dr Pape – Thank you for the response. We opened a conversation with Dr Yngve and will also seek Dr Nuzzo’s opinion. The biggest issue we see is the lack of availability (especially in Canada) and the cost right now! Otherwise, I’m with you on failing to understand the lack offerings and I’m encouraged by your support for it. Dr Yngve indicated that he is putting a training program in place at UTMB with the hope of having one new surgeon a year able to offer the procedure and scale up its availability. Maybe we’ll get some crossing the border too! Dr Pape, I was very ininterested reading about this blog, although it has left me a little confused about my son James who is nearly 5 (we are from and live in New Zealand). He was born at 37 weeks, ha spastic quad cp (non ambulatoty) but is definitely more affected in his lower limbs, less affected in trunk and arms and his speech is very clear. He also has hydrocephalus (unexplained) & we’ve just been advised he is not an ideal candidate for SDR at St. Louis hospital for this reason. Did you post more about full term patterns that James might apply to as I can’t seem to find anything. Thanks in advance for reading. Good question. your son definitely sound like a preterm pattern. In the period from 35-38 weeks, the type of brain injury can vary. I would suggest an MRI scan to more accurately tell the site and extent of brain injury. The co-existence of hydrocephalus suggests he may have had an early…even an in utereo intraventricular bleed that started the whole process.If he is not a candidate for an SDR, has he been evaluated for a baclofen pump?